Undefeated Filipino boxer Genesis Servania of ALA Promotions will face Hendrik Barongsay of Indonesia in an eight round non-title fight at Aichi Prefectural Gym, Nagoya, Aichi, Japan. 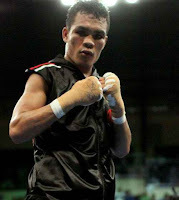 Servania is a 24 years old boxer from Bacolod City, Negros Occidental, Philippines. He has a record of 26 wins including 11 wins by way of KO and has no defeats. Servania is currently ranked no. 3 in the Philippines. He is one of the top contender in the super bantamweight division but loses his ranked after being inactive for almost 10 months. Servania fought Juan Luis Hernandez on Febuary 7, 2015. ALA promotions said that the young prospect is not working in a gym and gaining some weight. His oppoent Hendrik Barongsay is a Indonesian Veteran fighter with the record of 29 wins including 18 wins by way of KO and has 23 defeats. Hendrik Barongsay won his last figh via 4th round TKO against Chatpayak Sithkopon Nuengkawkawhok. This fight is included in the fight card of Kosei Tanaka vs Vic Saludar.